National Pizza Day – we have a recipe for that! It is believed that the first commercial pizza originated in Italy in the 18th century. 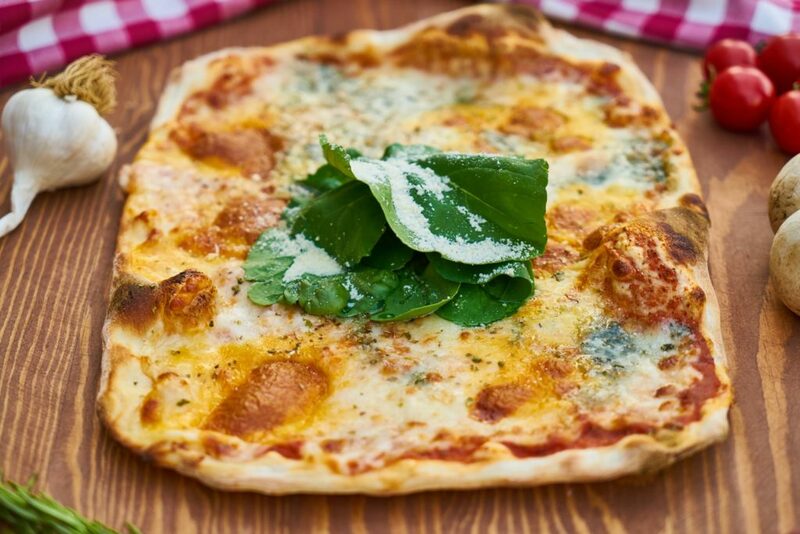 The pizza Margherita owes its name to Italy’s Queen Margherita. Apparently, in 1889, she visited the Pizzeria Brandi in Naples and the pizza maker created a special pie for her. It consisted of three colours in the Italian flag: tomatoes (red), mozzarella (white), and basil (green). The Hawaiian Pizza was invented in Canada; it is topped with tomato sauce, cheese, pineapple, and Canadian bacon or ham. Pepperoni is the most popular pizza topping. Saturday is the most popular night to eat pizza. It’s National Pizza Day and we are sharing our scrumptious Signature recipes for Pizza Sauce AND Pizza Dough. Delizioso! Strain tomatoes using a colander. Using your hands, puncture the tomatoes to release the juice contained. Meanwhile in a food processor, process garlic, basil and olive oil together. Add in strained tomatoes and continue to pulse until ingredients are incorporated. In the bowl of your KitchenAid use the paddle attachment to mix the flour, sea salt and dry active yeast on low speed until all is incorporated. Add the warm water. If the dough sticks to the sides sprinkle in a little more flour, if it is too dry then add a bit more water. After the 8 minutes have passed remove the dough from the KitchenAid and cut it into 6 pieces and form them into rounds. Place them on a lightly oiled cookie sheet and drizzle with 1 tbsp of extra virgin olive oil. Cover with plastic wrap and allow to sit at room temperature and rise for 1-2 hours. Sprinkle the counter with a little bit of flour, take one piece of dough and press down on it with your fingers until you have 1/2″ thick circle or oval. Using your fists and knuckles start stretching the dough until 10″ in diameter making sure not to tear it. Dust your pizza peel (or a piece of cardboard) very well with semolina flour or corn meal and set your pizza dough on it making sure it slides easily when moved. Pour 2-3 tablespoons of your pizza sauce in the centre and spread it around with the back of a spoon leaving 1 inch of space at the edges and making sure not to get any on the peel. Sprinkle with mozzarella cheese and add your favourite toppings. Gently slide the pie on the preheated pizza stone in a hot 525 degree F or more oven, and bake for 5 to 7 minutes or until golden brown on the edges. Remove from the oven and sprinkle with basil and freshly grated parmigiano reggianno. Allow pizza to rest for a few minutes for the cheese to set.